The holiday destination of Skagway, at the northernmost point of the Inside Passage, is the main port of call for cruise ships, and was the trading post serving the Klondike Gold Rush in 1897. Within three months, a tent and shack town of 20,000 people had sprung up and throngs of hopeful gold-seekers stampeded the town, the jumping-off point for the 500-mile (805km) trek to the goldfields in the Yukon. 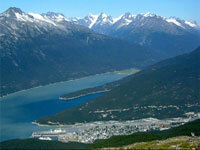 Skagway's rapid growth brought in its wake disease and violence, and it was notorious for lawless characters. Today much of Skagway town lies within the Klondike Gold Rush National Historic Park, which includes an excellent Visitor Information Centre offering fascinating exhibits and a film on the Gold Rush days. The heart of Skagway is the historic district where the wooden boardwalks lining the restored buildings, false-fronted shops and saloons, and the original appearance of many of the houses, all enhance the character of a town rich in Gold Rush history. On holiday in Skagway, it is also possible to follow in the footsteps of the Klondike gold seekers along the famous 33-mile (53km) Chilkoot Trail, literally an outdoor museum strewn with reminders of the past, where abandoned pick axes, shovels and old supplies can be found along the way.